Hyundai Motor Chief Vice Chairman Chung Eui-sun on Wednesday headed to Beijing on the same day the automaker announced an additional $250 million investment in ride-hailing service Grab in Singapore, industry sources said Wednesday. Chung’s Beijing visit comes as the carmaker seeks to breathe new life into its sales in the country. Sales of Hyundai and sister company Kia Motors dived last year amid a diplomatic dispute between South Korea and China over Seoul’s decision to deploy an US anti-missile system. Despite an improvement in bilateral ties, Hyundai’s sales in China continued to drop 6.2 percent in the third quarter on-year, further dragging down profit. The carmaker declined to comment on Chung’s visit to China. But the heir to South Korea’s largest automaker is expected to seek a breakthrough in Hyundai’s operations in China, the biggest market for all carmakers. Earlier in the day, Hyundai and Kia announced the investment of an additional $250 million in Grab and a deal to supply electric vehicles, signaling they are ready to jump into a market where demand for electric vehicle mobility services is quickly growing. This is the largest amount Hyundai and Kia have invested in a firm that is not a Hyundai affiliate, it added. The announcement came soon after Hyundai Motor Chief Vice Chairman Chung met with Grab founder and CEO Anthony Tan on Wednesday at a forum in Singapore. According to officials, Hyundai and Kia will invest $175 million and $75 million, respectively, in addition to the $25 million Hyundai invested in late January, bringing the total investment to $275 million. Among auto firms, Japan’s Toyota is the largest investor of Grab with $1 billion invested in June. Through the latest deal, Hyundai and Kia are seeking to tap into Southeast Asia’s electric vehicle market and to bolster brand image on the back of increased exposure to more drivers and partnerships with major firms in the region, mostly dominated by Japanese carmakers. “One of the fastest growing regions in the world, Southeast Asia will become a new EV hub. 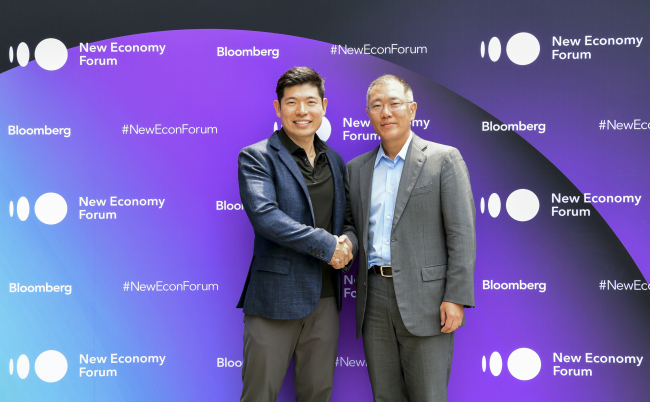 Grab is the perfect partner to expand EVs in the Southeast Asian market and build an EV ecosystem,” said Hyundai Motor Chief Innovation Officer Chi Young-cho. Looking for a breakthrough, Hyundai has been eyeing opportunities to enter Southeast Asia, the third-biggest car-sharing market worldwide after China and the US. Demand for electric vehicles in the region is expected to jump to 340,000 units in 2025 from 38,000 units in 2021 and 2,400 units next year, the company said. Southeast Asian countries are implementing policies to increase the presence of green cars with tax cuts and the expansion of infrastructure, among other measures. As the first step of the partnership, Grab will conduct a test run using 200 units of Hyundai’s electric vehicles for its service in Singapore starting next year, the company said. Kia is also looking into supplying electric vehicles to Grab. Established in 2012, Grab is globally the third-biggest ride-hailing service, trailing China’s DiDi and US-based Uber, and operates in 235 cities across eight Southeast Asian countries. To increase electric vehicle chargers in the region, Hyundai, Kia and Grab also agreed to forge partnerships with related companies, including battery suppliers, Hyundai said. Grab recently partnered with electricity provider Singapore Power to set up 1,000 chargers, including 30 high-speed chargers, by 2020.